The 3rd Annual Phoenix Biomedical Campus (PBC) luncheon – Visions of the Future – is right around the corner. Network with other PCA Members and learn what’s next for this essential Downtown asset! Parking: Parking is available on the southeast corner of Fillmore and 5th Street. To view a parking map, click here. We encourage attendees to walk, utilize the light rail, public transportation or rideshare services. This program will feature presentations from Wexford Science and Technology and their project with ASU, The Plaza Companies and Holualoa Capital Management on the Park Central development, and Banner University Medical Center’s plans for future development along the McDowell Road Corridor. 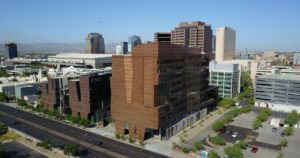 Guests will also receive a State of Biosciences in Phoenix presentation by Chris Mackay, City of Phoenix. Lunch will be catered by PCA Member Conceptually Social Catering and space is limited; please RSVP today. We look forward to seeing you Thursday, February 28th! The RSVP feature for this event will close 24 hours in advance and we will no longer be accepting registrations. Thank you for your interest in this event. We look forward to seeing you at another PCA Committee meeting or event soon!